Are you looking to start your own business? 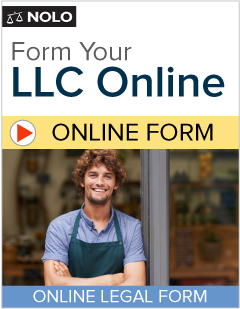 Nolo has a great suite of do-it-yourself legal business books and forms to help you create your business entity and get your business up and running. We can help you decide which legal structure is best and how to create your business entity. Learn the pros and cons of a limited liability company (LLC) versus a corporation versus a sole proprietorship. And find out how easy it is to form your business entity with our step-by-step instructions guiding you through the process. Nolo’s Online LLC let's you easily create an LLC in three easy steps.